Because these lovely little fliers become dependent on the nectar we provide, frozen (or empty) feeders can be dangerous in winter. WE ARE INCREDIBLY lucky to live in an area of the country where hummingbirds remain year-round. It’s a special treat to watch them perform their aerial acrobatics in all seasons. Hanging a feeder in winter helps attract overwintering hummingbirds and provides extra nourishment. When mixing the nectar, always use the recipe of 1 part cane sugar to 4 parts water. Clean the feeder regularly, using vinegar (dish soap can repel hummingbirds). Finally, make sure there is a full feeder hanging at the crack of dawn. After a long, cold night, the last thing we want to do is make these hungry little guys wait for their breakfast. Even if you hang a feeder, hummingbirds are more likely to make your garden their year-round home if it contains a variety of winter bloomers with nectar-rich flowers. Among the best of the winter-flowering shrubs are the Mahonias (Mahonia x media). 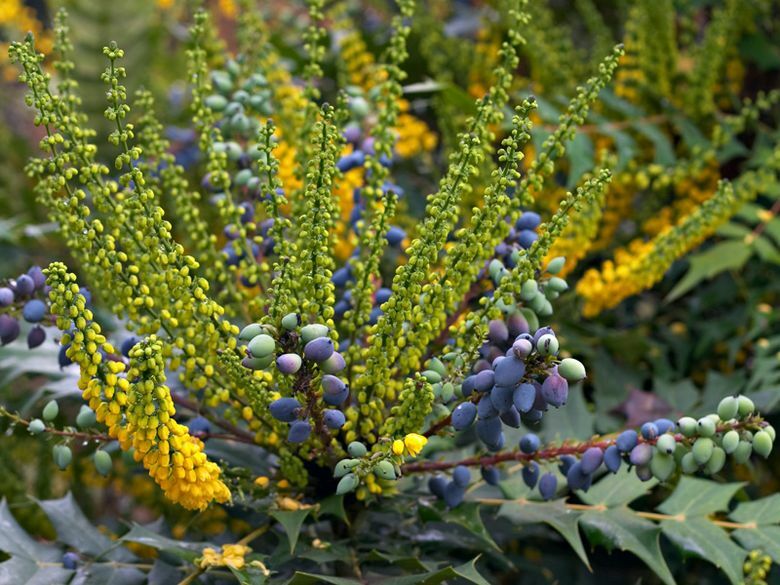 These Asian hybrids of our native Oregon grape are statuesque-looking, upright, drought-tolerant, shade-loving shrubs. 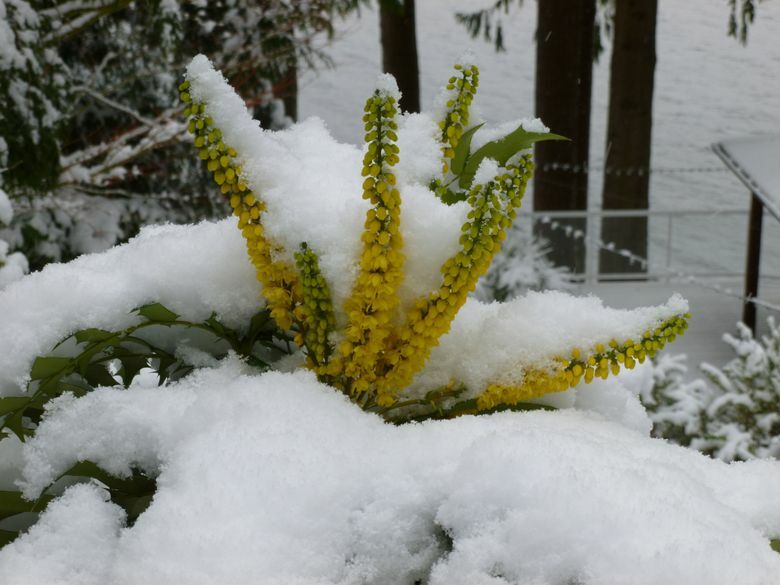 Hummingbirds love the long-lasting, soft, yellow, candelabra-shaped flowers that occur in the heart of winter. 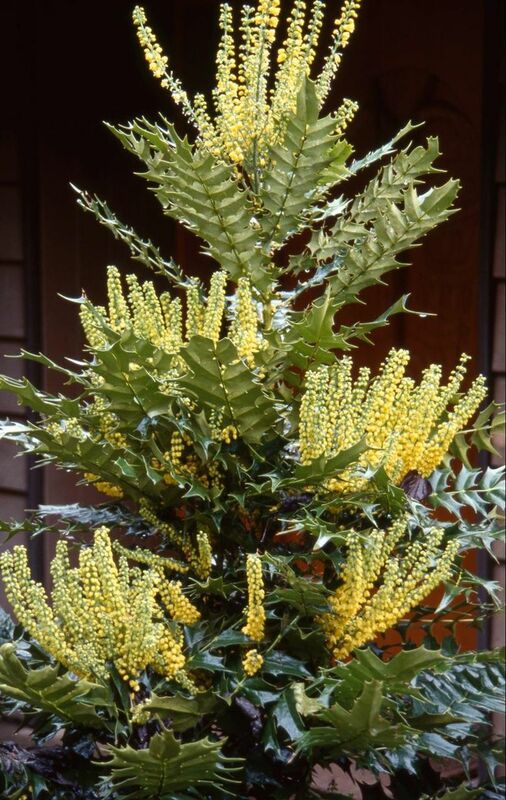 Mahonia x media ‘Lionel Fortescue’ is famous for the biggest and most frost-proof soft, yellow flowers of the clan. ‘Charity’, later-blooming and the tallest of the genus, towers to 15 feet, featuring beautiful sprays of pastel yellow flowers. The more-compact, 8-foot tall ‘Winter Sun’ scents the winter garden with large sprays of wonderfully fragrant light-yellow flowers. 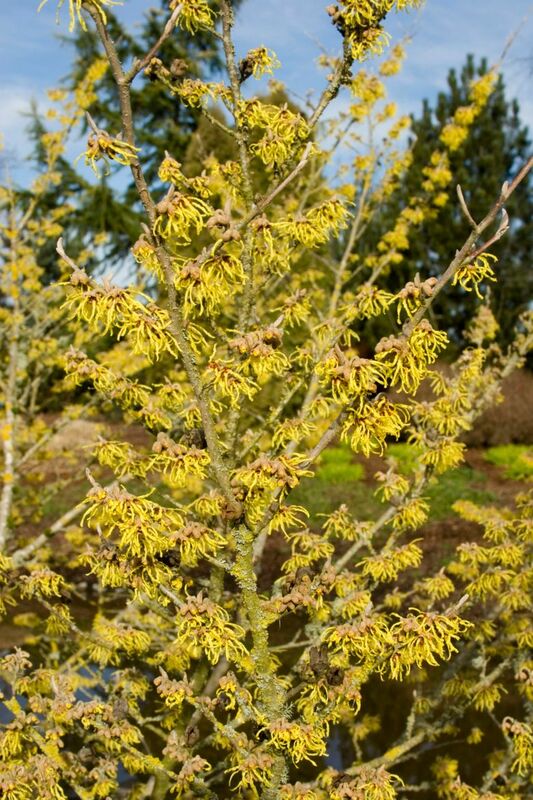 By early December, another hummingbird favorite, witch hazels (Hamamelis), begin to bloom. 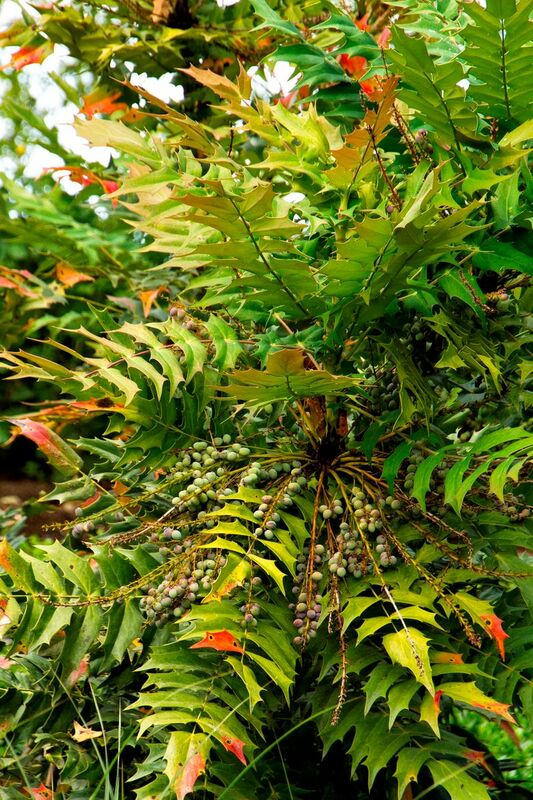 These small trees light up the winter garden with colorful, spidery flowers on bare branches. It’s easy to find a spot for one of these gorgeous trees. Most hybrids rarely exceed 12 feet, and bloom well in sun or shade. Another small tree that flowers on bare wood, and does equally well in sun or shade, is Viburnum x bodnantense ‘Dawn’. Drought-tolerant and extremely cold-hardy, these tough little trees produce pink, deliciously fragrant flower clusters prized by hummingbirds all winter long. 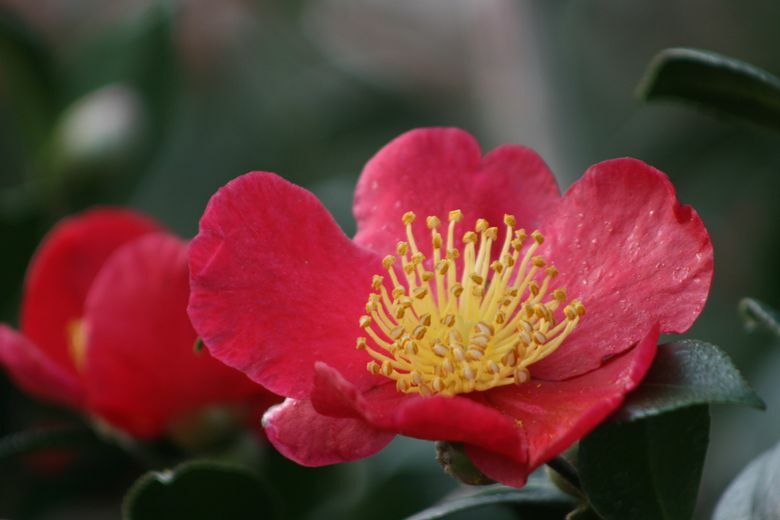 A shrub that provides holiday cheer and sustenance to hummers is Camellia sasanqua ‘Yuletide’. Given an open, sunny location, its bright-red flowers, centered with golden stamens, often open right on Christmas. 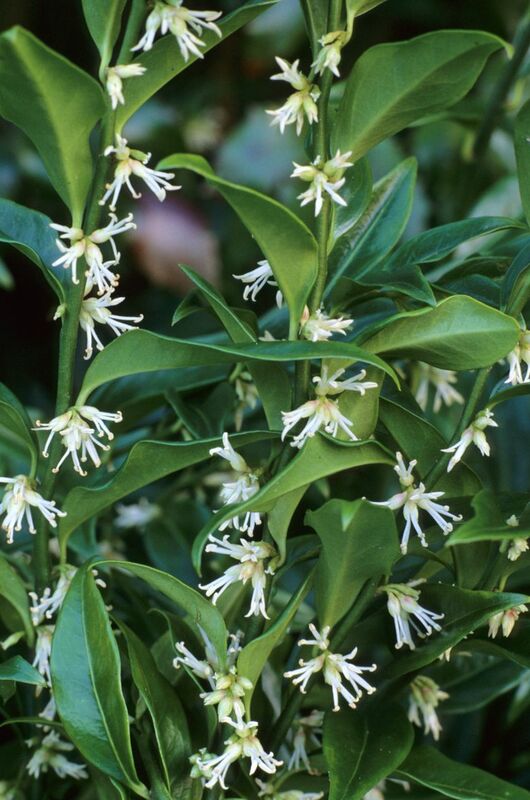 In January, sweetbox (Sarcococca), a great shrub for dry shade, bursts into bloom. The white flowers are tiny, but amazingly fragrant. Although hummingbirds lack a sense of smell, they zero in on the gazillions of nectar-laden flowers as soon as they begin to open. 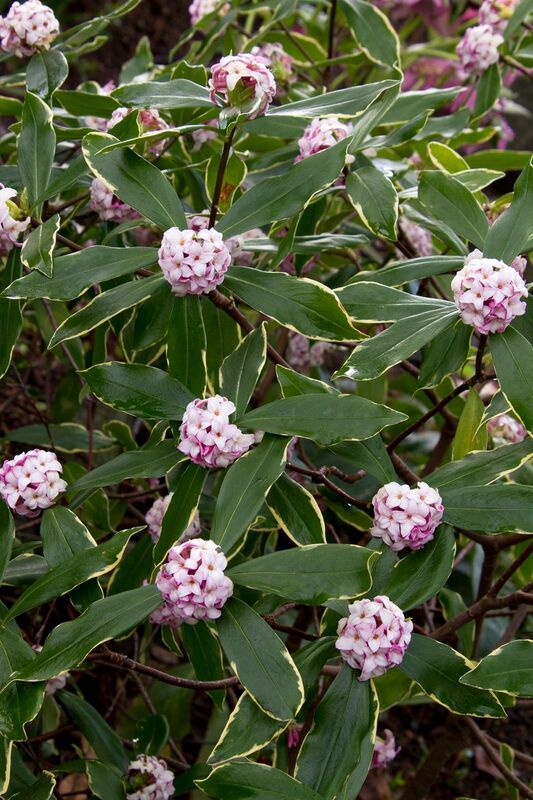 Aromatic flowers are often nectar-rich, and winter daphne (Daphne odora) is no exception. You’ll see the Anna’s hummingbirds frequent the February blooms soon after their spicy scent fills the garden. If you want to drive the Anna’s gaga with desire, try to find a Grevillea victoriae. 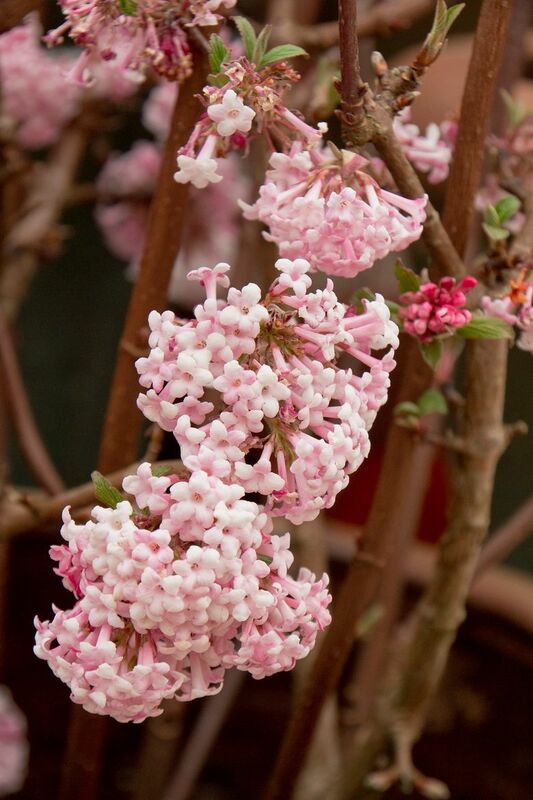 These somewhat-rare shrubs often show up in spring at plant sales and, occasionally, at local nurseries. Planted in full sun and well-drained soil, these Australian natives have proved surprisingly hardy and long-lived, often exceeding 6 feet tall and wide. The abundant clusters of inch-long, scarlet flowers that cover the plant all winter are so spectacular, you’ll love this plant just as much as the hummingbirds do. Finally, try not to be too fastidious about cutting back the plants in your mixed borders and perennial gardens in fall. Insects and spiders that inhabit the garden are high in protein and constitute an important part of a hummingbird’s winter diet. On warm days in winter, insects often hatch out and take to the air. There’s nothing more entertaining than watching the hummers snatching nutritional midwinter snacks right out of the air.